The Samsung Galaxy S5 comes in underhanded in this test due to its smaller 2,800mAh battery, compared to the 3,000mAh unit on the LG G3. The G3 may need every advantage it can get, as its large QHD screen should account for quite a bit of extra consumption. For this section, we're still in the process of testing our newly arrived European G3 review unit, so we'll be using the figures we got from the Korean LG G3 we've had for a while. We'll update this section once we have the final numbers. The Samsung Galaxy S5 is able to achieve a respectable score of 72 hours, which equates to exactly three days of usage on a single charge. 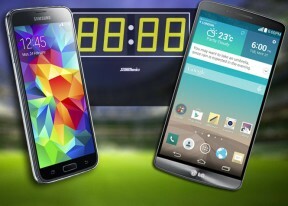 The LG G3 achieves a very comparable score of 69 hours. 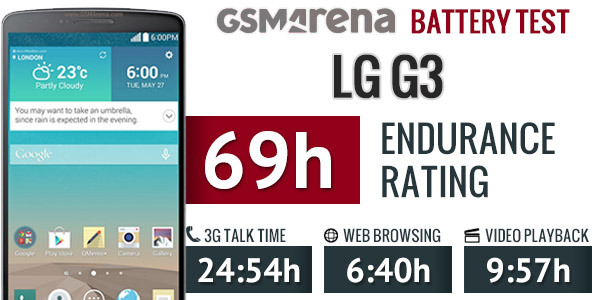 3G talk time was one area where the LG G3 excelled. 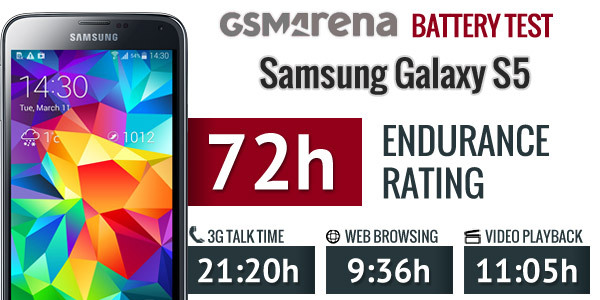 It ranks near the top of our battery life table in this aspect, scoring a full 3 hours longer than the S5. The decisive victory - or should we say embarrassing defeat - in the individual tests comes in the web browser department, where the Samsung Galaxy S5 enjoys nearly a three hour lead on its rival. The poor web browsing performance is one of the more disappointing aspects of the LG G3. Things are a bit closer in the video playback test, although here the S5 still has an advantage over the G3 by about an hour. If you think about it in reverse, the S5 will be left with more charge in the battery after watching the same movie on both phones. In the end, the Samsung Galaxy S5 will likely last you longer than the LG G3 in an identical use pattern, although if you tend to do a lot of web browsing, the G3 will definitely disappoint. Both phones have super power-saving modes that disable some of the phone's features to extend the time to the next charge. Winner: Samsung Galaxy S5. The composite endurance rating isn't that much in Samsung's favor, but the very poor web browsing performance really brings the G3 down, despite respectable scores in the other two categories plus great standby figures.